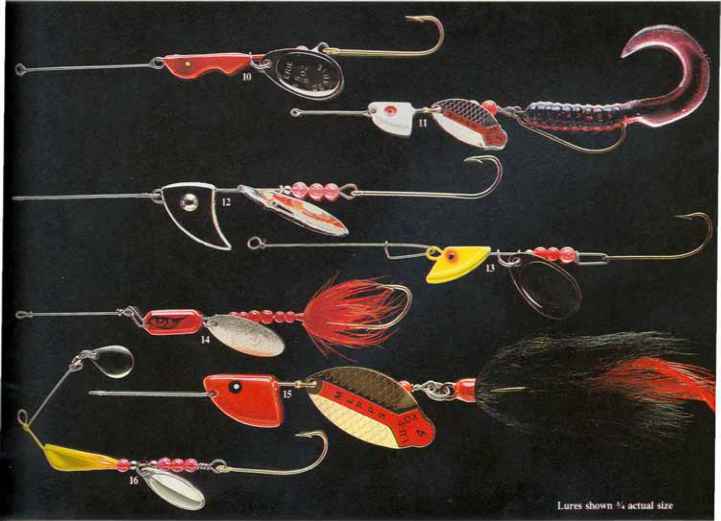 Propbaits are the most versati1e of a1l surface lures. You can fish sma1l spots thorougbly with a twitching retrieve or cover large areas by ree1ing rapid1y. 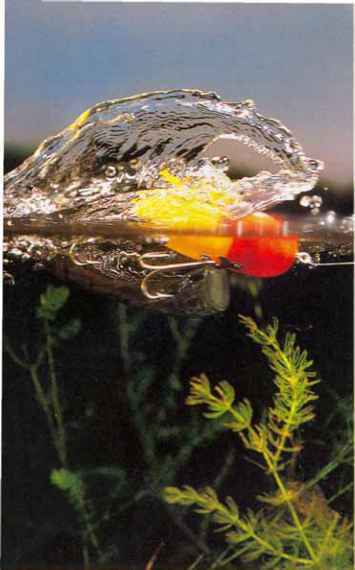 And propbaits create more disturbance than most other surface lures, so they work wel1 even when wind ripples the surface. 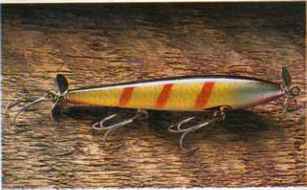 A slow, twitching retrieve genera11y works best for largemouth, sma11mouth and spotted bass; a fast, steady retrieve for pike, muskies, stripers and white bass. A few propbaits have a weight in the rear, so they can be fished with awalk-the-dog retrieve. Some propbaits have a flattened or dished face, resulting in a more erratic action than models with a pointed nose. Models with a propel1er on each end create the most disturbance and work best for fast retrieves. 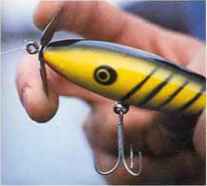 On some brands, the twin props counterrotate to prevent the entire lure from spinning. The tack1e used with propbaits is simi1ar to that used with stickbaits. And 1ike stickbaits, propbaits are usua1ly tied direct1y to the line. If you use a heavy snap and leader, the nose may run below the surface, preventing the propellers nom throwing water. PROPBAITS have an elongated, usua1ly unweighted body, and an attachment eye at the nose. Some mode 1s have a propeller at only one end, others have propellers at both ends. 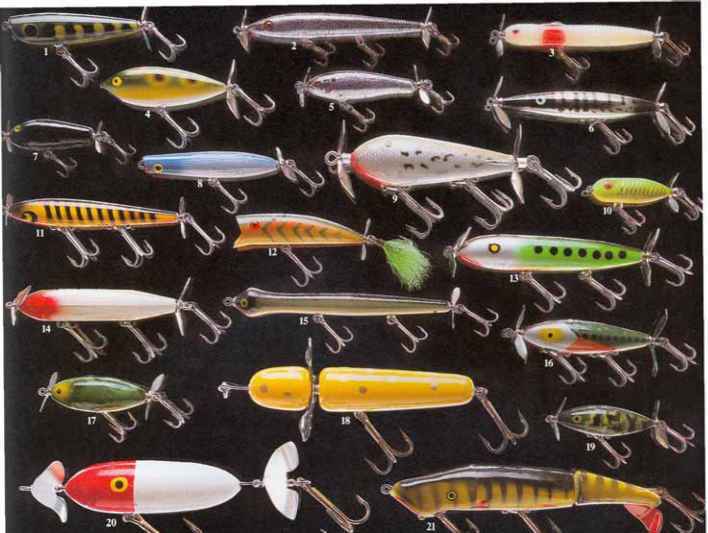 Devil's Horse~ (12) Bomber Popper, (13) Bass Agitator, (14) Creek [email protected] Injured Minnow, (15) Snake Bait, (16) Nip-I-Diddee~ (17) Spin Scout, (18) Trophy, (19) Skipjack, (20) Topper StopperTM, (21) Mud Puppy. TUNE the blades if they do not spin rapidly. Adjust the angle by bending the blades backward or forward (above); the pitch by twisting them. TWITCH a propbait with slack line for the best action. By starting with slack line, you can jerk the lure more sharply than you could with a taut line, yet the lure will move only a few inches. 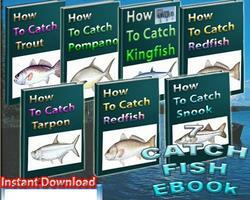 Continue retrieving in short twitches followed by pauses until the lure puns away from the cover.